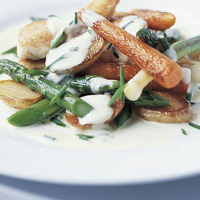 The potatoes, carrots and leeks in this dish do not take much time to roast because they are parboiled first. And to save on washing up, the chicken and vegetables are cooked in one roasting tin. Preheat the oven to 200°C, gas mark 6. Cook the potatoes, carrots and leeks in boiling water for about 5 minutes. Drain thoroughly and add to a large roasting tin with the asparagus. Add the oil, toss and season. Arrange the chicken fillets on top and bake for 25 minutes. Meanwhile, heat the crème fraîche, mustard and chives in a small saucepan for 1-2 minutes or until just heated through, then season. Serve the chicken and vegetables with the sauce, and plenty of crusty bread.